A compass (or mariner's compass) is a navigational instrument for finding directions. It consists of a magnetised pointer free to align itself accurately with Earth's magnetic field. A compass provides a known reference direction which is of great assistance in navigation. The cardinal points are north, south, east and west. A compass can be used in conjunction with a clock and a sextant to provide a very accurate navigation capability. This device greatly improved maritime trade by making travel safer and more efficient. A compass can be any magnetic device using a needle to indicate the direction of the magnetic north of a planet's magnetosphere. Any instrument with a magnetized bar or needle turning freely upon a pivot and pointing in a northerly and southerly direction can be considered a compass. A compass dial is a small pocket compass with a sundial. A variation compass is a specific instrument of a delicate type of construction. It is used by observing variations of the needle. A gyrocompass can also be used to ascertain true North. 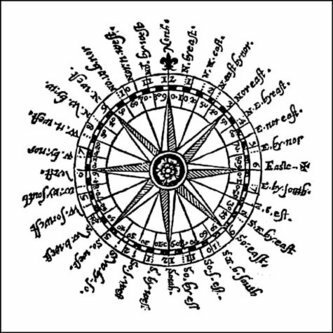 Compasses were initially used in geomancy in ancient China. The first known use of Earth's magnetic field in this way occurred in ancient China as a spectacle. Arrows were cast similarly to dice. These magnetised arrows aligned themselves pointing north, impressing the audience. The earliest record of use of magnetic lodestone as a direction point was in a 4th century Chinese book: "Book of the Devil Valley Master"
"Dream Pool Essays" written by Song Dynasty scholar Shen Kua in 1086 AD contained a detailed description of how geomancer magnetized a needle by rubbing its tip with lodestone, and hanged the magnetic needle with one single strain of silk with a bit of wax attached to the center of the needle. Shen Kua pointed out that the needle prepared this way some times pointed south, some times pointed north. The earliest record about the use of compass in navigation was Zhu Yu's book "Pingzhou Ke Tan" (Pingzhou Table Talks) of 1117 AD. Prior to the introduction of the compass, wayfinding at sea was primarily done via celestial navigation, supplemented in some places by the use of soundings. Difficulties arose where the sea is too deep for soundings and conditions are continually overcast or foggy. Thus the compass was not of the same utility everywhere. For example, the Arabs could generally rely on clear skies in navigating the Persian Gulf and the Indian Ocean (as well as the predictable nature of the monsoons). This may explain in part their relatively late adoption of the compass. Mariners in the relatively shallow Baltic made extensive use of soundings. In the Mediterranean, however, the practice from ancient times had been to curtail sea travel between October and April, due in part to the lack of dependable clear skies during the Mediterranean winter (and much the sea is too deep for soundings). With improvements in dead reckoning methods, and the development of better charts, this changed during the second half the 13th century. By around 1290 the sailing season could start in late January or February, and end in December. The additional few months were of considerable economic importance; it enabled Venetian convoys, for instance, to make two round trips a year to the eastern Mediterranean, instead of one. Around the same time traffic between the Mediterranean and northern Europe increased, and one factor may be that the compass made traversal of the Bay of Biscay safer and easier. A magnetic rod is required. This can be created by aligning an iron or steel rod with Earth's magnetic field and then tempering or striking it. However, this method produces only a weak magnet so other methods are preferred. This magnetised rod (or magnetic needle) is then placed on a low friction surface to allow it to freely pivot to align itself with the magnetic field. It is then labeled so the user can distinguish the north-pointing from the south-pointing end; in modern convention the north end is typically marked in some way, often by being painted red. Modern navigational compasses hold a magnetized needle inside a fluid-filled capsule; the fluid causes the needle to stop quickly rather than oscillate back and forth around magnetic north. 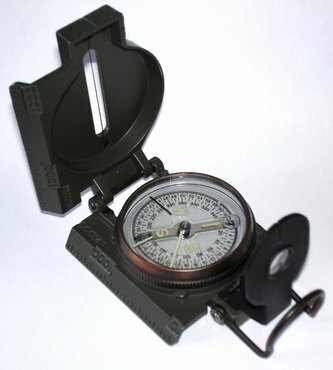 Other features common on modern handheld compasses are a baseplate with rulings for measuring distances on maps, a rotating bezel for measuring bearings of distant objects, and a sighting mirror that lets the user see both the compass needle and a distant object at the same time. Mariner's compasses can have two or more magnetic needles permanently attached to a compass card. These move freely on a pivot. A lubber line, which can be a marking on the compass bowl or a small fixed needle indicates the ships heading on the compass card. A ship's compass must be corrected for errors, called compass deviation, caused by iron and steel in its structure and equipment. The ship is swung, that is rotated about a fixed point while its heading is noted by alignment with fixed points on the shore. A compass deviation card is prepared so that the navigator can convert between compass and magnetic headings. The compass can be corrected in three ways. First the lubber line can be adjusted so that it is aligned with the direction in which the ship travels, then the effects of permanent magnets can be corrected for by small magnets fitted within the case of the compass. The effect of non-ferromagnetic materials can be corrected by two iron balls mounted on either side of the compass binacle. The graph of the compass deviation can be understood using Fourier series. The coefficient a0 representing the error in the lubber line, while a1,b1 the ferromagnetic effects and a2,b2 the non-ferromagnetic component. Science Friday, "The Riddle of the Compass (http://www.sciencefriday.com/pages/2002/May/hour2_053102.html)" (interview with Amir Aczel, first broadcast on NPR on May 31, 2002).